Hundreds of millions of people worldwide suffer from diabetes. Their bodies either can’t produce or process insulin properly — so they have to regularly inject themselves with shots of freeze-dried insulin. But researchers at MIT may have found a futuristic solution: a high-tech smart pill called SOMA — yes, we get the Aldous Huxley reference, but it also stands for “self-orienting millimeter-scale applicator” — that releases periodic doses of insulin into your stomach with an integrated needle. “We are really hopeful that this new type of capsule could someday help diabetic patients and perhaps anyone who requires therapies that can now only be given by injection or infusion,” said Robert Langer, an MIT professor and senior author of the study, in a statement. The curvature of the pill’s shell ensures it always stays upright. And that’s important: the pill needs to keep contact with the stomach lining. The shape itself is based on the leopard tortoise, which has the ability to self-right from any orientation. 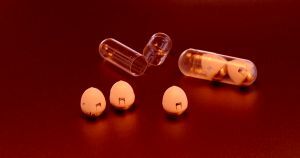 The pill contains exactly the same kind of freeze-dried insulin as found in today’s insulin injection kits, but compressed. It takes roughly an hour for the insulin to be fully released. The pill will then make its way safely through the digestive tract. The researchers have already successfully shown the pill’s ability to release insulin in animal trials using pigs. The pill could have groundbreaking implications for diabetics everywhere.